Tom Krens on Beacon Hill in the 1980s pleading a case for Mass MoCA. Giuliano photo. 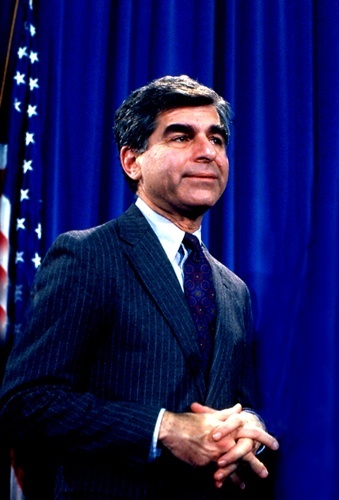 Governor Michael Dukakis signed a bill creating Mass MoCA during his last day in office. Giuliano photo. Governor William Weld was skeptical of plans for Mass MoCA. Charles Moore was the first architect whom Krens worked with for Williams. Giuliano photo. 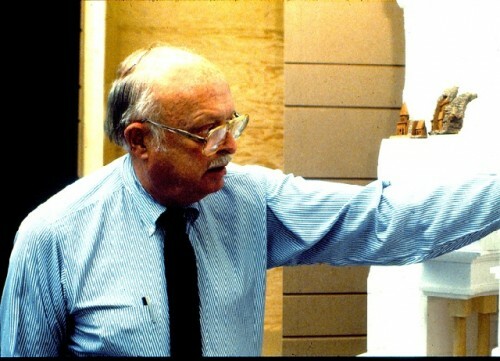 Joe Thompson during the early days of Mass MoCA met with the media. Giuliano photo. The Frank Lloyd Wright designed museum opened in 1959. The Peggy Guggenheim Museum of Venice. Giuliano photo. 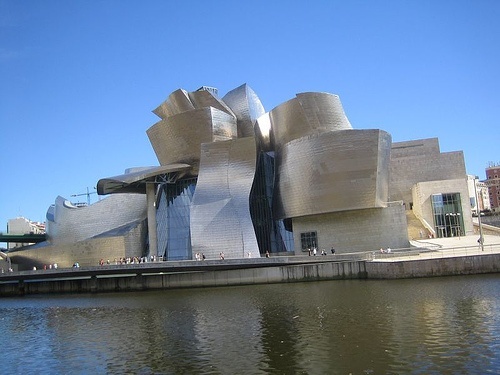 The Frank Gehry designed Guggenheim Museum in Bilbao. Today it was learned that there is another major vacancy to fill along Museum Mile in New York City. 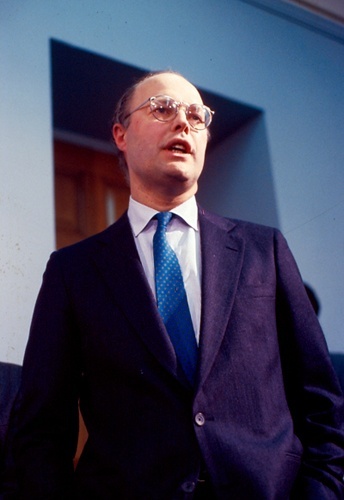 Recently it was announced that Philippe de Montebello will leave the Metropolitan Museum of Art, which he joined in 1963, and served as its director since 1977. In July, while he remains until a new director is appointed, Tom Krens, now 61, will have been director of the Solomon R. Guggenheim Museum for twenty years. He will remain with the Guggenheim as the senior advisor for international affairs. His primary task is finishing the construction of a 452,000 square foot satellite museum in Abu Dhabi. This new museum is also designed by Frank Gehry who was the architect for the Guggenheim Museum in Bilbao, Spain. Similar international projects were initiated but have not gone forward for a variety of reasons. The museum in Abu Dhabi will be 35 percent larger than that in Bilbao which has proven to be the most successful of the projects completed by Krens. The Spanish museum is considered to be a destination drawing a million annual visitors for its dramatic architectural design. Exhibitions, such as a controversial focus on motorcycles, which originated in the New York Guggenheim have traveled to Bilbao, Berlin and Las Vegas. Predictably, the motorcycle show was a smash when it launched the Las Vegas Guggenheim. Despite this initial response the Vegas project was shut down just 15 months after it opened in 2001. 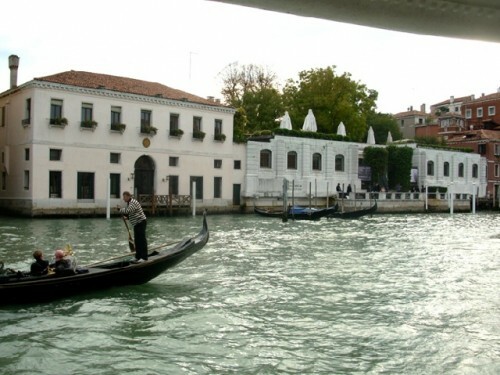 The Guggenheim Foundation also includes the Peggy Guggenheim Museum in Venice, which has doubled its original space. In addition to these other building projects Krens saw the New York museum through two renovations of the Frank Lloyd Wright building which opened on Fifth Avenue in 1959. The first renovation was completed in 1992, at a cost of $80 million, and a second phase of renovation, at $29 million, will be finished by the summer. 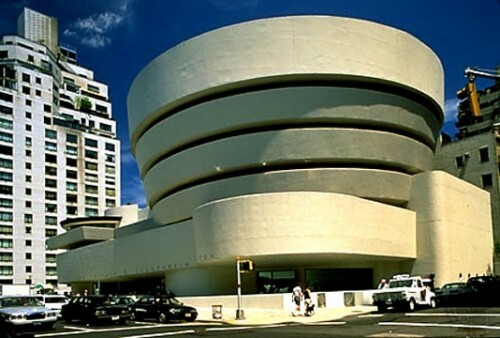 During the first renovation the Guggenheim maintained a branch in Soho which later closed and plans for another New York building have been abandoned. There were other expansion initiatives which never got beyond the planning phase involving the architect Jean Nouvel in Rio de Janeiro, Brazil, and Zaha Hadid in Tokyo, Japan and Taichung, Taiwan. There was also a project with Enrique Norten for Guadalajara, Mexico. During his time at the Guggenheim, Krens has changed the definition and mandate of major museums and qualifications for their directors. His initial premise was that museums generally have far more objects in their collections than space to show them. Major exhibitions are so expensive to organize that it is cost effective to create a circuit on which to rotate them. While museums routinely share costs, exchange works, and create tours for exhibitions the notion of Krens was to create sustained partnerships and franchises that result in ongoing revenue streams. Some have critiqued this as the museum world equivalent of a Ponzi scheme. While other museums have taken a page from the Krens playbook. The Museum of Fine Arts Nagoya, for example, is a partnership between the Museum of Fine Arts Boston and a franchise in Japan. The mission of the Solomon R. Guggenheim Museum has greatly evolved since it was founded in 1939 as the Museum of Non Objective Art. While providing dramatic new potential for major museums to extend their reach, and create networking with global connections, it has proven to be a stressful, high stakes strategy. It has the impact of stretching the limits of staff and resources. While a rising economy makes such ventures feasible any downturn and reversal, such as the impact on New York tourism following 9/11, and the current sour economy, can have a major impact on the always delicate infrastructure of the arts. After 9/11 the operating budget was, for a time, reduced by half leading to the cancellation of exhibitions and staff layoffs.The Guggenheim is just one of many major cultural institutions attempting to restructure debt and administrative strategies. In the competition for arts funding there are only so many deep pockets to reach into. This is particularly intense when several cultural institutions in a given community are simultaneously in the midst of capital campaigns. To sustain such ambitious global expansion projects requires enormous revenue. Three years ago, Krens went head to head with the foundation's greatest benefactor, the Cleveland based philanthropist Peter B. Lewis, who gave the museum $77 million or four times that of any other donor. Twenty years ago, when Krens took over at the Guggenheim, the endowment was $20 million compared to $118 million today. But Lewis was critical when Krens used a percentage of the endowment to cover operating expenses. Lewis also urged Krens to spend more time focusing on the New York museum and less on globe trotting and expansions. Krens prevailed in that conflict but the collateral damage caught up with him as the current leadership adjustment has been initiated by the Board of Directors. To share the load and responsibilities shouldered by Krens in September, 2005, Lisa Dennison was elevated from deputy director and chief curator, to the position of director of the New York branch of the museum. Last summer she left the Guggenheim to join Sotheby's. Since then the museum has sought with little success to find a replacement, with a general sense among potential candidates, of a reluctance to serve under Krens. There is a perception of arrogance associated with Krens, particularly when seen in the context of infighting. But is it a matter of ego and blind ambition or vision and innovation? Perhaps there is a measure of both in the equation. I interviewed Krens, more than 20 years ago, when he raised $8 million as director of the Williams College Museum of Art. He had completed an expansion of the museum by Charles Moore who also designed the enlarged Hood Museum of Art for Dartmouth College. In Hanover, I visited with Moore on several occasions and discussed his projects for Art New England. I met with Krens, on assignment for Art News, to cover a breaking story of his plans for the former Sprague Electric campus in North Adams which opened, in 1999, as Massachusetts Museum of Contemporary Art. We spent the day touring abandoned buildings which were then in varying states of disrepair. I vividly recall Krens manipulating a large ring of keys that let us into vast empty buildings. In what is now the largest gallery in Building Five he discussed the idea of taking out the second floor to create a basilica like space with rows of clerestory windows on either side. This is exactly how the space appears today. After the tour of buildings we proceeded to his office in the Williams Museum where he had set up several blow ups of plans and diagrams for Mass Moca. There was a map of Massachusetts with a pin point representing North Adams. Around it were drawn circles representing drive time to the city as well as demographics. He was using marketing strategies to calculate potential visitors to the complex. In the pre power point era these were the visuals which he used to convince Governor Michael Dukakis to commit $35 million of Commonwealth revenue for the project. Dukakis signed the bill during his last day in office and it was promptly vetoed by the new governor, a Republican, William Weld. By then, Krens had departed to take over the Guggenheim and it was up to his protÃ©gÃ©, Joe Thompson, to take the project forward with an opening in 1999. Thompson, like Krens a Williams alumnus, is currently in the midst of a $35 million drive for Mass MoCA. It is interesting that the speculation of who best fits the profile of the next director for the Guggenheim focuses on Michael Govan, another Williams alumnus. 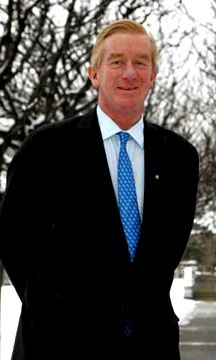 For the past two years, Govan has been director of the LA County Museum of Art. Before that, he was the founding director of Dia Beacon which is frequently compared to Mass MoCA in scale and mandate. During a recent lecture at the Clark, Philippe de Montebello discussed how, for a time, he shared administration at the Met with a business manager. Eventually he became the top executive. There has been a trend to divide museum administration between an art person, curator/art historian, and a business specialist. Krens, who has an MFA, as well as an MBA from Yale, was an example of a museum director capable of making both aesthetic and business/ marketing decisions. De Montebello, David Ross and Kathy Halbreich represent museum directors with bachelor degrees who acquired administrative skills on the job. After five years under a Ph.D., Maxwell L. Anderson, at the Whitney Museum of American Art, that direction proved to be unsuccessful. The pragmatic has come to be more valued than the scholarly among museum directors. Of which Krens is regarded at the paradigm. Under the headline of "Thinking Big at the Guggenheim" in the May 29, 1988 issue of the New York Times, reporting on the Krens appointment, Grace Glueck asked the question on the mind of many New York arts leaders "Tom Who?" She stated that "New York was slightly confounded last January when Thomas Krens, a farm-team player who heads the Williams College Museum of Art, was named to the prestigious post of director of the Guggenheim MuseumÂ… Only a handful knew that Mr. Krens, age 41, is a powerhouse who had brought the international art scene to sleepy Williams' door, and audaciously masterminded Mass MoCA, a $50 million project aimed at converting an abandoned factory complex in nearby North Adams into the world's biggest museum of contemporary art." Gleuck went on to discuss his work at Williams representing "Â…its conversion from a pokey teaching institution to a glamorous showcase for international art." In the twenty years since Gleuck described Williams as a "pokey teaching institution" much has changed. Last week, Nancy Spector, an alumna of the Williams/ Clark graduate program, returned to Williamstown to lecture on Felix Gonzalez-Torres. The college is currently showing his piece "Placebo." 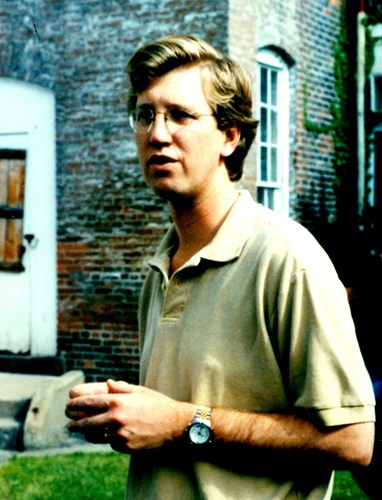 Spector curated his retrospective for the Guggenheim as well as for the American Pavilion of the recent Venice Biennale. During a period of questions I asked about the challenges of installing work in the demanding space of Wright's whirling dervish of an interior. With some humor she discussed using gravity to let the installations flow down the ramp and that she now finds it daunting to create exhibitions in rectangular spaces. Spector is an example of the so called "Williams Mafia" which has come to dominate the field of curators and museum directors. The success and failure of Krens, a career that started in Williamstown with his great vision for Mass MoCA, and now takes a down turn in his resignation from directing the Guggenheim, has created a template for how museums function in the 21st Century. In the past 20 years there has been unprecedented growth and expansion of museums and cultural institutions. But, as the battle with Lewis implied, dramatic growth and expansion may prove to be a house of cards in the event of a sustained downturn in the global economy. We may now be at just such a tipping point. Here in the Berkshires we are enormously grateful to Krens. While he was too ambitious to remain in a "pokey" bucolic, little college town he jumped started what is now a remarkable legacy. Today, there is the vital and expanding Mass MoCA. Last summer, the Williamstown Theatre Festival moved into a new, state of the art structure. After a long bump in the road WTF is striving to recover some of its former artistic prominence. The Clark Art Institute will unveil a new Tadeo Ando designed building this summer. Williams and the Clark continue to organize major exhibitions and colloquia such as one this weekend on the subject of African and African American art. We are fortunate to be a part of one of the leading cultural centers in America. Tom Krens represents a significant part of that legacy. Given those accomplishments a touch of arrogance just goes with the territory.